Hire creative Graphic Designers in Adelaide, Australia for designing Logos, Banners, Pamphlets, Infographics, Business Cards, Avatar, Character and more. At ChicMic, our designers think & perform far beyond your imagination. Let’s create a design, you will love! Every game, app & website we design features high-quality graphics as well as functionality. We are the best Graphics Design Services Company with 6+ years of experience in multiple art & designing aspects. To accommodate your needs, we have a team of professional designers experienced in designing Logo, Banners, Pamphlets, Infographics, Business Cards, Avatar, Character, Game & 3D. Our graphic design services are designed for Mobile/video Games, Web Page, Theme Designs, Game Interfaces & App Design. 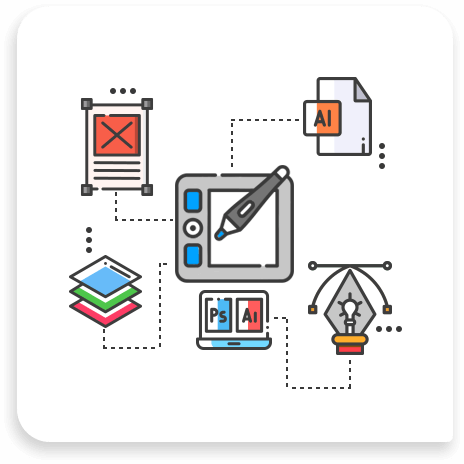 The graphic designing software that we are expert in includes Adobe Photoshop, Adobe Illustrator, Sketch App & Adobe Animate/ Flash. From every screen to a major asset, we are committed to providing an array of stunning graphics to bolster your online presence in the digital arena. We outsource Graphics Design Services in Perth to cater to the needs of Startups & Enterprises. Hire mobile game graphics designers at ChicMic.